The vision for this project was established early on through a variety of meetings which united the design team on topics such as biophilia, sustainability, best construction practices, energy, water, and healthy materials. The early architectural concept was to provide ample opportunities for fresh air ventilation, views of nature, and daylight. The concept sketches illustrate how this was to be accomplished. Further, an important goal was to use non-toxic, inert, healthy, and beautiful materials throughout the project. A natural landscape of native edibles was an important goal as well, which resulted in blackberries, loquots, sunflowers, and other herbs surrounding the building. With the exception of some conventional (instead of red list free) materials being used on the exterior of the building due to budget constraints, the lofty goals of this very special project were almost entirely met. The result is a healthy,equitable, and beautiful building which functions excellently for its occupants. 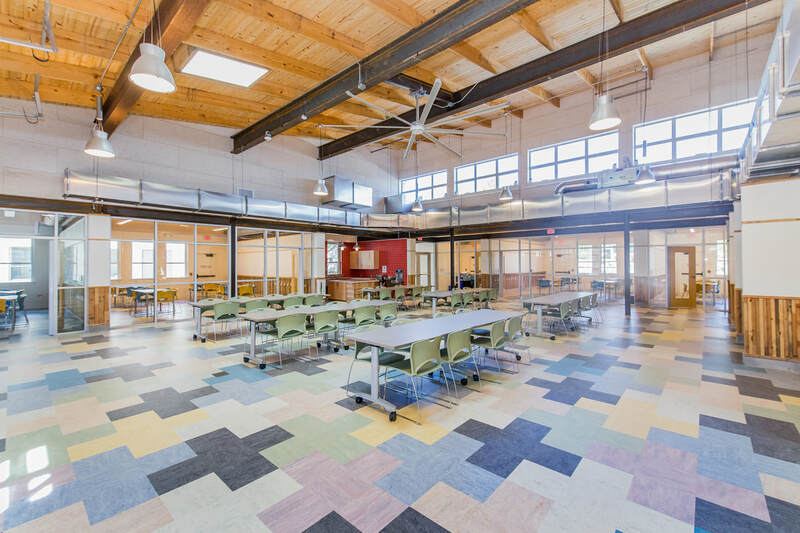 The Lakeline Learning Center reduces energy consumption by focusing on the expanding the occupant thermal comfort zone, passive strategies to reduce solar and thermal loads, and a simple yet efficient HVAC system. High volume, low speed (HLVS) fans in each of the spaces increase the ambient air velocity in the space to increase the temperature range occupants are comfortable at in the space from the traditional 74 deg F up to 78 – 80 deg F depending on the activities. This reduces the overall refrigeration loads in the space and amount of time the HVAC system needs to provide energy intensive cooling. Overhangs and windows were optimized to maximize daylight in the space to reduce the use of electric lights while managing the solar gains into the space. The three skylights in the main space were added late in design after daylighting analysis showed reduced light levels. The impact of the additional direct solar gain from the skylights compared to improvement in daylight levels were checked in the energy model and found to have no negative impact. The HVAC system is simple yet efficient. A DX Heat Pump Rooftop RTU provides cooling to the space with zone control provided by electric reheat boxes. The design originally started with a VRF system. However, analysis during budgeting found significant cost savings by changing to a heat pump system and adding PV panels to make up the difference. 100% of the energy for the building is provided by roof mounted photovoltaic panels. Toilet flushing is the largest use of water for this facility so very high efficiency fixtures are supplied with rain water collected from the roof. The sinks and drinking fountains were required to be served by city water even though the rain water is treated to potable standard within the building. Irrigation for this project Is supplied with potable water due to regulations concerning separation of supplies between the learning center and surrounding apartments. Ample time was invested vetting materials in order to satisfy the stringent Living Building Challenge Materials Petal requirement. While achieving this petal in full was not financially viable for this project, careful and thorough work went into selecting as many healthy materials as possible based on their abilities to not only meet the Red List Free criteria but also their geographical relation to the jobsite zone and how they affect indoor air quality. In order to make the biggest impact on the health of the occupants, all interior materials with the exception of the windows and some pipe shrouds are Red List Free, low- or zero-VOC, as well as PVC- and vinyl-free. Some specified materials were readily identified as Declare Red List Free. For those products which weren’t, extensive additional research was done to provide documentation via Health Product Declarations, Environmental Product Declarations, and the Chemistry Abstract Service database. Structural finger jointed lumber was used in order to make use of salvaged material. Waste 2x4 wood was diverted from the landfill and reused as a durable wainscoting throughout the building. Natural linoleum flooring was chosen because it was both durable and vinyl-free. Cellulose fiber insulation was used in all interior and exterior walls. No-Added-Urea-Formaldehyde millwork and recycled content countertops were used throughout the project. All exposed plumbing water and waste water lines were cast iron or copper. The Michael & Susan Dell Foundation Learning Center at Lakeline Station Apartments is currently pending a Living Building Challenge Petal Certification. The Learning Center at Lakeline Station sits in the Edwards Aquifer Recharge Zone, a geophysical area made up of the Balcones Canyonlands and the Texas Blackland Prairie. The pre-design condition of Lakeline Station was comprised of Ash Juniper, cattle, lawn, and two Oak trees. The two Oaks were preserved and stand as anchors to a new landscape of low-water and edible plants that surround the Learning Center. Rainwater harvesting was incorporated to capture water from the roof and from the air conditioning condensate. Once established, all plantings will be able to succeed on captured rainwater alone. Raised beds for food production were also incorporated for the residents, providing community gardening space, as is a small orchard to the north of the building that provides shade, food, and seasonal interest to the residents. 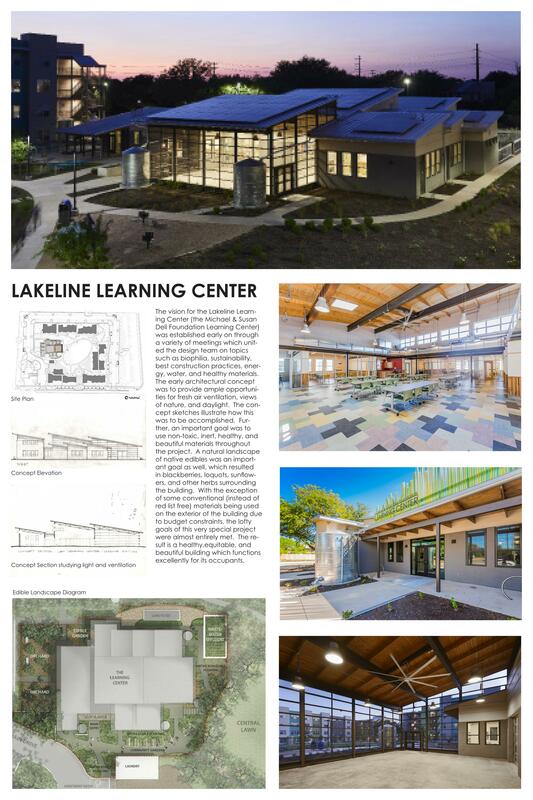 The health and wellbeing of building occupants and the community were among the top concerns which shaped the design of the Lakeline Learning Center. In an effort to meet the Living Building Challenge’s requirement for a healthy living environment, 22 chemicals on the LBC’s Red List (and their derivatives) were avoided wherever possible. As a result, the building is primarily constructed of healthy materials, particularly in the interior environment. The health and wellbeing of occupants was the driving force in almost every decision. Building materials such as the wood and steel structure, as well as the flooring, cabinets, acoustical panels, and other finishes are made of natural and healthy materials. The visual connection to nature was also paramount. This resulted in an abundance of windows, a large screened porch, clerestory windows for natural ventilation and sky views, and a native edible landscape. Bike parking and routes as well as green courtyard play lawns and a walkable site encourage healthy living, and are baked into the property’s daily functions due to the site layout of the residential apartments and their proximity to the Learning Center. Green housekeeping is maintained through the developer’s commitment to stocking only non-toxic cleaning supplies. The most powerful operational strategy is Foundation Communities’ staff. All of their property managers and lead maintenance staff earn the National Affordable Housing Management Association Certified Green Property Management credential, a professional certification requiring they participate in a 16-hour green O&M course covering energy, water, waste, indoor air quality, integrated pest management, and other green operations topics. Foundation Communities’ green housekeeping program provides a dispensing station with Green Seal certified cleaning chemicals for maintenance staff and janitorial contractors. Common areas are outfitted with a recycling container next to every landfill container, as well as centralized collection for hazardous waste items such as CFL bulbs and batteries. The developer also engages residents in green operations. Each resident receives a small package of tools to help them live green in their new green homes upon move-in. These include their own recycling bin, a recycling magnet, information on energy and water saving devices and tips, a spray bottle with a green cleaning recipe, and recommendations for conservative thermostat settings. Additionally, a food pantry is set up in the Lakeline Learning Center to assist residents during times of financial need. Foundation Communities is proud to be a long-term owner-operator of 19 communities in the Austin area. As such, they are committed to investing in high quality building materials and systems that improve energy efficiency and long-term performance. All materials and products are reviewed by Foundation Communities’ team and architects to ensure that energy efficiency, durability, regional sourcing, recycled content, and chemical content meet the project’s goals where possible. The team’s material and product choices also focus on health impacts, particularly for interior spaces. Sealants, adhesives, paints, caulks, etc. are all reviewed for compliance with the relevant SCQAMD Rules, and all composite wood products are verified to have no added urea formaldehyde. Because traditional funding sources do not cover the added costs of green design and construction, Foundation Communities fundraises to achieve our green goals. 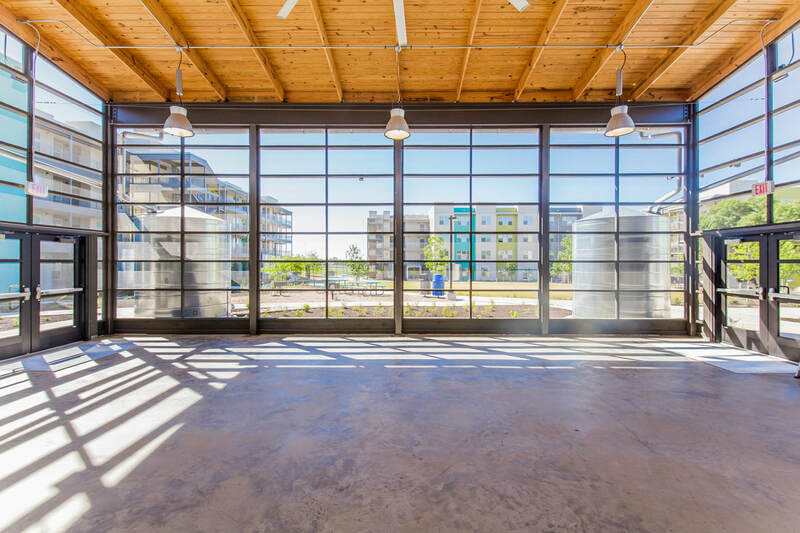 With great commitment and effort, the developer’s past nine new construction and rehab projects have received green building certification from LEED, EGC, and/or AEGB. At Lakeline Station, a grant from the Kendeda Foundation helped to push the envelope on the green design of the Lakeline Learning Center and pursue petal certification through the Living Building Challenge, a rigorous proven performance standard for buildings. The developer of this project, Foundation Communities, is a local, homegrown nonprofit. They provide affordable, attractive homes and free on-site support services for thousands of families with kids, as well as veterans, seniors, and individuals with disabilities. Foundation Communities uses is Learning Centers as an important tool in actively addressing social and economic equity by offering an innovative, proven model that empowers residents and neighbors to achieve educational success, financial stability, and healthier lifestyles. The program for the Learning Center is derived from years of testing and engagement at the developer’s 22 other properties. The Learning Center for the Lakeline Station Apartments was designed primarily for after-school and summertime support for young children with indoor and outdoor activities as well as for a wide variety of adult activities. The building sciences are intentionally expressed inside and outside of the structure by keeping all systems visible. The clear display of structural, mechanical, plumbing, and electrical systems are intended as a didactic teaching opportunity for the children. The water tank at the front entry has a level indicator which the children monitor regularly with their teachers. The landscape surrounding the Lakeline Station Learning Center is a functional and productive landscape that echoes its Central Texas location. The project highlights vegetation that responds to human need (food production) and human experience (shade and community). Garden beds near the main gathering space utilize hardy, low-water plants, eight raised beds fed by rainwater harvesting provide community gardening opportunities, and a small orchard of fruit trees provides more shade and food. Given that numerous children use the learning center each day, all of these landscapes can be used to further ecological education. The site is located in the Lakeline TOD overlay, is within 0.75 miles of the Lakeline transit station with multiple bus stops, and is in close proximity to Lakeline Mall, an abundance of retail, employment, recreational amenities, and excellent schools. Community integration is very important to the long-term success of Foundation Communities and the perception of affordable housing in Austin. This is why the developer dedicates time, resources, and staff to building strong relationships with schools and develops ‘neighborhood teams’ comprised of individuals who live, work, and worship in the surrounding community and volunteer to support new residents. The building's clear and functional floor plan allows it to easily adapt to changing programmatic needs through time. A large central Indoor Gathering Area provides a flexible neutral space which hosts children’s games, education, and play during the day, and adult Zumba, nutrition, and finance classes in the evening. This flexible space, as well as the Outdoor Gathering Area screened porch, can be reprogrammed to meet the needs of the community for a variety of events. The Classrooms circling the central space are also adaptable to a variety of uses such as technology, teaching, and play. Their simple volumes, high ceilings, and natural daylight encourage continued use even as programmatic needs change in the future. All the exterior windows in the building are operable. This functionality allows users to modify the building's porosity depending on climate conditions. Blackout shades over the three skylights allow for further customization. These elements contribute to resilience because ample access to daylight and fresh air allows the building to remain functional as an assembly area even in the event of loss of power. 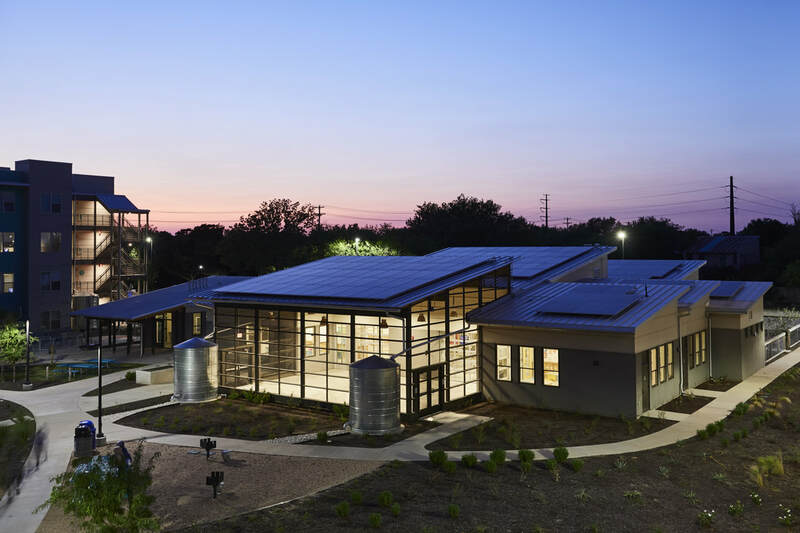 Solar panels and rainwater cisterns add significant functionality and resilience to the building and its occupants in the event of natural disasters. STRUCTURAL ENGINEER : INTEGRITY STRUCTURAL CORP. ACCESSIBILITY : ALTURA SOLUTIONS, L.P.